You probably know him as Captain America, the big, huge Hollywood blockbuster powered by Marvel, but he's also an aspiring director, and "Before We Go" is his much smaller directorial debut. He also plays the main character, Nick, who is in New York for a jazz audition. His co-star Alice Eve plays Brooke who is lost in New York without her purse after it was stolen. Nick, being the nice guy he is, leaves his evening of playing trumpet at the train station to help her find her way around after she drops her phone right in front of him. It's a little too contrived the way she drops the phone literally right in front of him without seeming to notice, but it does give him a reason to meet her. She's directionally challenged as well, so Nick's willingness to help her find her way around the big city gives her reason to stick with him. Of course, there's the first few awkward interactions to wade through while Brook makes up her mind about him, but after that the two strike up a meaningful friendship. She's cold at first, until she decides he isn't a creeper, but after that she does prove to be a caring person who's fun to be around. He's patient enough to wait for her to come to the conclusion that he isn't some kind of monster, which she comes to after seeing how genuinely nice and charming he is. The two happen to be dealing with some tough personal things at the time that require their attention before the night is out. Neither of them can afford to put off dealing with these respective issues, and since they've become travel buddies they're willing to help each other out. Nick isn't only there for a jazz audition. In fact, more important to him, is going to a friend's wedding after party where he'll get to see the ex-girlfriend that broke his heart. The reason the meeting is so important to him is because he still has hope that she hasn't lost her feelings for him. Brooke, on the other hand, is married, but her husband has been cheating on her, and she's struggling with what she should do next. These intimate details about their lives seem easier to share with someone who has no previous knowledge of their lives. It allows the freedom to share things they might not have with the people they know. They also know very well that they've only got one night, a matter of hours, together so there's no sense in hiding their true thoughts or feelings, which also allows them to grow very close, very quickly. It's not a tale of romantic love so much as one of genuine friendship. They've not known each other long enough, nor do they have the time to make anything deeper. It isn't for lack of trying. After all, these two are keenly aware of their own longing and fear of future regret. You never quite know how important the decisions we make are until after they've been made. They can lead to a lifetime of happiness, or regret. To them the worst failure they could have would be to let an opportunity slip past them because they were afraid to take action. There is an attraction between the two, and perhaps even the potential for something more if only they had the time to explore it. However, neither can uproot their separate lives over a friendship that's developed over the nighttime hours. Knowing this, there'd be no sense in taking their relationship further, considering how new it is. To the writer's (Ronald Bass, Chris Shafer, Jen Smolka, Paul Vicknair) credit these characters do feel real, and their situations genuine. 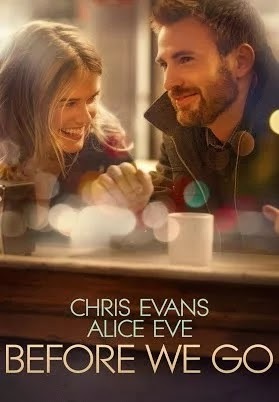 For his part, Chris Evans gives a good performance, and as director, gets a good one out of co-star Alice Eve. There's some nice, but not flashy cinematography that accentuates the city around them. This emotional tale is well done, and surprisingly affecting. However, the whole project feels a little too much like movies we've seen before. If there were a film that combined Sofia Coppola's "Lost in Translation" with Richard Linklater's "Before Sunrise," and it were set in New York, "Before We Go" would be that film. They seem the obvious inspiration for this film. There are nods to both films (aside from generally being in the same vein in the first place). For instance there is a scene where they visit a fortune teller, much like in "Before Sunrise," and they find themselves waiting out the night in a hotel room wearing bath robes while sharing thoughtful discussion rather than anything physical, much like in "Lost in Translation." And finally, Nick leaves a note (or drawing?) on the back of a hotel feedback card that he put in her coat pocket. She turns the card over, but we aren't allowed to look, much the way Coppola ended "Lost in Translation" with a whisper we aren't allowed to overhear. The words the great Roger Ebert wrote about the whisper at the end of "Lost in Translation" apply just as well to the ending here, "I loved that we're not allowed to hear it. We shouldn't be allowed to hear it. It's between them, and by this point in the movie, they've become real enough to deserve their privacy. We get all we need in simply knowing they share a moment private to them, and seeing that it contains something true before they part forever." It isn't that these aren't beautiful moments, in beautiful films, but generally speaking imitation is rarely as moving as our first encounter with the original. It depends on where you fall, some won't be able to accept it for its obvious imitation, while others will love another film in the same vein. I find myself somewhere in the middle. Nevertheless, I would call it a successful outing for Chris Evans.